Tagomago is located only 5 minutes away (by boat) from Ibiza (it is less than 900m off the coast of Ibiza). It will take you less than 45 minutes to get you from Tagomago to Ibiza downtown, allowing you to participate in all the lifestyle that Ibiza has to offer, without any logistic affords. If you wanted to go to the famous hippie market of San Carlos, that would only take 15 minutes from Tagomago. Unbeatable panoramic sea views, a peaceful environment, chill out spaces with breathtaking sunsets, wide open spaces throughout the whole villa, the ultimate in appliances and commodities, the possibility of enjoying outdoor sports all by yourself if you wish!, all of this, makes Tagomago, one of Europe's most desired private islands. Tagomago Island offers an intimate hideaway, a perfect getaway for selective clientele, close to Europe’s most idyllic island of Ibiza, yet who seek the ultimate in luxury combined with privacy & discretion. Tagomago Island covers 600,000m2 and is surrounded by turquoise waters and a unique flora, edged with picturesque sea cliffs and beaches. Its beaches and moorings lie on the west coast, providing guests with excellent opportunities for swimming, diving and all types of water sport. Here, there is a small jetty in a protected bay, just like that of a private port. This area of the island is easily reachable by boat or helicopter, within minutes from the cosmopolitan town of Ibiza. The only mansion on the island is situated right in the middle. The entire estate is surrounded by magnificently spacious terraces with breathtaking views in all directions, such as the island of Ibiza, the Mediterranean sea or the 17, x 8m swimming pool. The Jacuzzi is also located on the vast pool terrace. The terraces in general have been furnished in a very modern, chill out style. There is also separate accommodation for the staff. The villa’s stylish and contemporary interiors have all been decorated by world celebrated interior designers and feature 5 bedrooms, all with en-suite bathrooms. Modern luxury is complete with high-tech touches of LED light systems, WiFi internet, and sound systems by Bang and Olufsen. 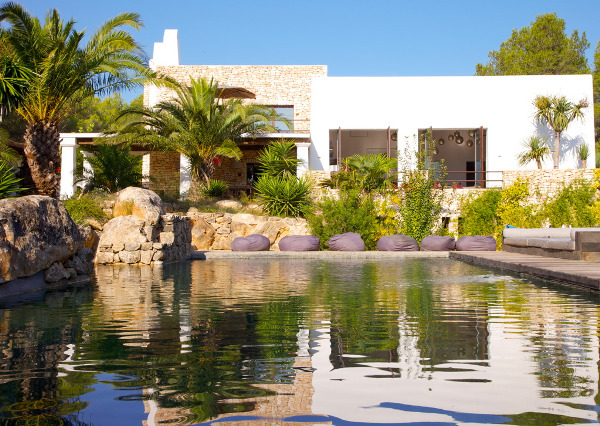 The villa’s extensive outdoor living areas offer views of Ibiza from the spacious terrace and vast lawn areas with sun beds and other outdoor furniture, alongside a swimming pool of 145 m2. Price on application specific to your requirements and start from Euro €200,000 per week, please enquire.